Mahindra Two Wheelers, a part of the Mahindra & Mahindra group inaugurated its R&D centre in July, 2012 near Pune; since then the company has started to look forward and has developed its first motorcycle, the Centro. This motorcycle gave a big boost to the company, which sold more than 1 lakh units in less than 6 months. The reason behind the success of Centro is a number of firstin- class features in it. To replicate the success, Mahindra has launched its unisex scooter, the Gusto, for Indian and global markets. The name Gusto is a derivative of ‘gust’ which is a sudden strong current of wind, symbolizing the spirit of freedom. 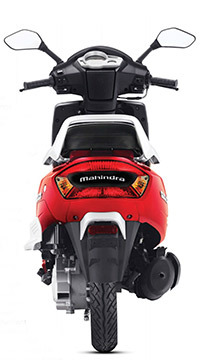 Mahindra has been in the scooter segment for some time now, selling the Rodeo and Duro. 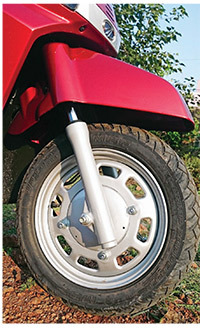 Both these scooters weren’t all-new products – these were products that Mahindra inherited from the Kinetic-SYM legacy. So what is new in the Gusto? It is technologically advanced and Italian styled; Gusto is the first global scooter to be developed at the company’s R&D Centre in Pune. The scooter has been designed keeping consumer inspired technological innovations in mind. It comes with a host of innovative features – a good example is the unique patented ‘Height Adjustable Seat’, making it easier for both male and female riders. Recently, we took the Gusto for a short spin in Chennai to find out how unique the scooter is and whether it would perform well in the crowded scooter segment in India. The front end of the Gusto looks sleek and sharp, resembling the Kinetic Honda. The company informed that the design has distinctive, contemporary styling which has its origins in Italy; it has been conceptualized based on extensive research and in-depth consumer insights. The front apron adorns a faux aluminium panel that houses the Mahindra logo in the middle, stylish fins placed in between a set of clear lens indicators. The handlebar-mounted headlight is a typical scooter affair although the design of the headlight itself is quite curvaceous. The newly-designed headlight provides good visibility at night, and comes supported by a set of LED pilot lamps. The instrument cluster is neatly laid out and covered by a silver console that displays a speedometer, an odometer and fuel-gauge. Below this sits a reliable, spring-fit openair compartment, for temporary carriage of a cell phone or wallet. This open compartment practically adds more value to the riders helping them store their belongings for the time being. The quality of switch gear along with fit and finish is satisfactory but the plastic quality is a bit crude. On the utility side, the vehicle is fitted with 2 bag-hooks in place for quick storage.